Posted on Mon, Jan 2, 2012 : 5:59 a.m.
NEW ORLEANS — For as good as the Michigan football team has been this year defensively, big wide receivers presented matchup issues for much of the season. And Virginia Tech has a stable of them. "Their wide receivers will be the biggest wide receivers we've played against all year," defensive coordinator Greg Mattison said this weekend. In fact, all but two Hokies players with at least 17 yards receiving this year are 6-foot-2 or taller, and the two exceptions are top receiver Danny Coale (6-foot) and star tailback David Wilson (5-10). That could pose matchup issues for the Wolverines in their game against Virginia Tech on Tuesday in the Sugar Bowl (8:30 p.m., ESPN). The tallest starter in their secondary is 6-foot, and the only player on the two-deep any bigger (Marvin Robinson at 6-2) isn't expected to play because he is facing second-degree home invasion charges. So, how will the Wolverines counter? 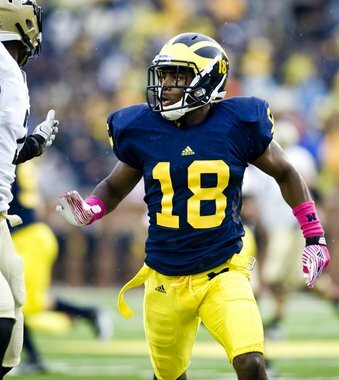 Freshman cornerback Blake Countess has 36 tackles and six pass breakups this season. Cornerback Blake Countess was eased into the rotation throughout the early part of the season before finally taking the starting job from senior Troy Woolfolk against Purdue. He became an unexpected stalwart for Michigan's defense, and showed against Iowa's Marvin McNutt that he can be effective against big receivers, despite his 5-foot-10, 176-pound frame. Mattison said he needed to see only "about one play" before he had enough confidence to match up Countess against McNutt. "One thing about corners that have a chance to be really good, they have a very, very short memory," Mattison said. "Their conscience isn't very good, because just about the time in practice where you're yelling at a young man for not doing what he's supposed to be doing, he's already forgot what you just said, and he's ready to play the next play. "You can tell if a guy kind of has it. ... He has it." Countess said he works well against bigger receivers because he takes so many repetitions working on his technique and discipline against them. It goes back to a piece of advice his father told him since he was a boy in gymnastics and karate: "Proper preparation prevents piss-poor performance." "He’s been telling me that since I was little, even when I wasn’t playing football," Countess said. The 18-year-old from Baltimore began competing in gymnastics when was 3 years old. He said he thinks that background is part of what has helped separate him as a cornerback. "I don’t really notice it, but people tell me I got good hips and good balance, things like that," Countess said. "Whereas, if it’s someone without a gymnastics background, if they’re doing the same thing, (it's harder)." Countess finished with 36 tackles in the regular season and had six pass break-ups, second on the team behind J.T. Floyd. He also forced a fumble. He's already begun drawing comparisons to former great Michigan corners. He says he's most often compare to Donovan Warren. High praise for a player who turned 18 two days before the start of fall camp — but he's earned it. "I don’t think I ever felt like a freshman — some of the older guys remind you that you're a freshman, though," he said with a smile. Mon, Jan 2, 2012 : 6:58 p.m. If you really look at body type and playing style, the guy Countess reminds me of the most is Ty Law, who I think should be in the NFL Hall of Fame one day. Law had a long and often times dominating career and won 3 SB rings. Blake will have great Sophomore and Junior Seasons and go pro is my feeling. Mon, Jan 2, 2012 : 2:13 p.m.
Blake is the best secondary player since Charles Woodson. He will be the next Michigan All American. It is unfortunate &quot;Butch's boy&quot; was injury prone. Great kid but when injured lacked the speed to compete effectively. Mon, Jan 2, 2012 : 12:52 p.m.
Leaving the Jackson, MS area for NOLA in a couple hours! GO BLUE!!!!!! Mon, Jan 2, 2012 : 7:09 p.m.
Say hola to NOLA and bring home a win! Mon, Jan 2, 2012 : 5:43 p.m.
who dat up there, who dat down there? who dat up there saying who dat down there? Mon, Jan 2, 2012 : 12:25 p.m.
Well, i think most UM fans would agree that at least one of our Corner back positions will be taken care of for the next few years. Countess has played fantastic as a freshman, and is arguably the best CB on the roster. Floyd has played well too, and the Corner position should be an area of strength next season. For now, Im looking forward to watching this defense get after it in the Sugar Bowl. Go Blue! Tue, Jan 3, 2012 : 5:13 a.m.
Yep.. He looks good in highlights. I wouldnt be surprised if he got some time on the field as well. Mon, Jan 2, 2012 : 5:38 p.m.
Terry Richardson is coming on next year. From the films and analyst comments he has the same hip flexibility as Countess.